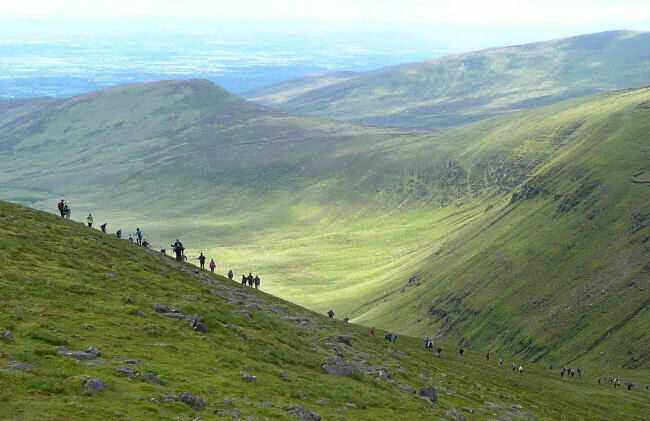 The self navigating Galtee Challenge is a 31km traverse of the entire Galtee Mountain range, taking in all major peaks with a total height gain of 1700 metres approx. and a maximum altitude of 919 metres. It is advisable that participants should have completed other long distance walks with at least 1,500m ascent or more. This is a Challenge Walk for the experienced walker with a high level of fitness. In addition to the physical challenge, it is a test of navigation skills especially in poor weather conditions. The direction is east to west, starting in Cahir, then to Farbreaga, Greenane, Galtee Beag, Galtee Mor, Slievecushnabinna, Carrignabinnia, Lyracappul and Temple Hill with the finish at Anglesboro. The Challenge is self navigating with checkpoints as shown on route cards which will be given to participants at sign-in on the morning. All participants must carry their own map (OSI MAP 74), compass and mobile phone and be proficient in their use. It is highly recommended that all participants have at least 2 litres of water, sufficient food for the day and appropriate clothing and boots. A high level of fitness is essential for this walk. If a walker is unable to complete the course he/she must contact the phone number on the route card. Everyone who completes the Challenge will receive a certificate and medal. The sign-in point is the Community Hall in Anglesboro Village in south-east Limerick, eircode V35 V126 (map) where scones and tea/coffee will be provided to participants before boarding the buses to the walk start in Cahir. Refreshments will also be provided in the hall at the end of the walk. 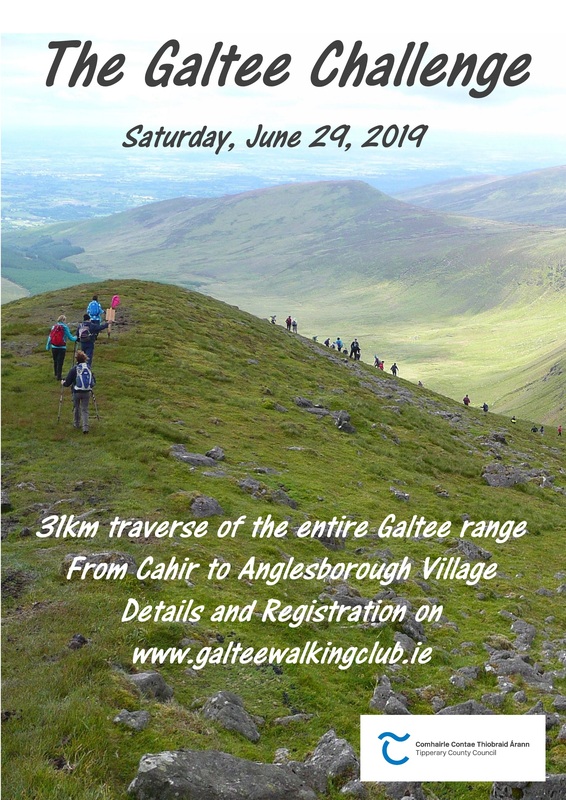 Sign-in for the Galtee Challenge opens at 7:30am on the morning of the event in Anglesboro Community Hall and buses will depart at 8:00am to the start in Cahir. Registration and payment can only be done online through the form below. No entries will be accepted on the morning of the event. Registration will close at 9pm on Thursday, June 27, as we need to know the numbers for the bus operators. When this form is submitted you will be taken to a page with a link to the PayPal site where you can pay the registration fee with your PayPal account or credit card. Participants shall be aware that there is a danger of personal injury or death and accept these risks and agree to be responsible for their own actions. Submitting this form confirms that you accept these conditions. Thanks to Tipperary County Council for their support for this event.